It is unfortunate that in early music authenticity has led to sterility rather than creativity, and it is doubly unfortunate that this stylistic sterility has spread beyond early music to the mainstream repertoire. Just as the world and the music of audiences are never one and the same, so the stylistic world of the musician should never be one and the same. Evidence of the power of stylistic diversity is provided by viola da gamba virtuosos Fahmi Alqhai. Born in Seville in 1976 with a Syrian father and Palestinian mother, Fahmi Alqhai spent his first 11 years in Syria before studying in Europe with teachers including Paolo Pandolfo. He has gone on to play with leading ensembles including Jordi Savall's Hesperion XXI while also performing flamenco and jazz. In between all that, and presumably in deference to the vagaries of the classical music industry, the young violist also qualified as a Bachelor of Dentistry at the University of Seville. 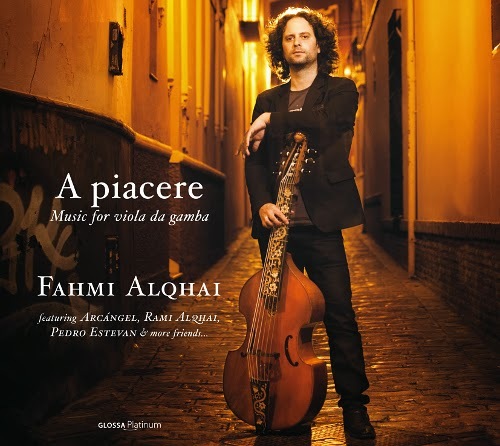 Fahmi Alqhai's mission, as expressed in the notes for his latest album A Piacere, is to rescue the viola da gamba from "long and dismal obscurity" and to embrace "repertoires beyond time and space with neither artistic not technical restraints". A piacere is a marking denoting freedom of expression, and the new album introduces jazz influenced stylistic freedom to early music with the assistance of notable musical mavericks including regular Jordi Savall sideman and percussionist extraordinaire Pedro Estevan - audio samples here. Thankfully A Piacere is serious classical music with a hint of jazz, rather than the more familiar and less pleasing cross-over formula of serious jazz with a hint of classical. A Piacere replaces the sterility of authenticity with the virility of diversity, and the same admirably nuanced formula is found in Fahmi Alqhai's earlier album Rediscovering Spain made with his Accademia del Piacere ensemble. Last year Universal Music ceo Max Hole told classical music that it must "ride the wave of change or die". So, speaking of rediscovering Spain, it is ironic that in the same month that independent label Glossa launches A Piacere, the lead release of Universal Music's flagship Deutsche Grammophon label is an album of celebrity guitarist Miloš Karadaglić performing Rodrigo warhorses. But to prove Universal Music is fearlessly riding the wave of change, Miloš Karadaglić adds an admittedly exquisite Takemitsu transcription of Lennon & McCartney’s Michelle. 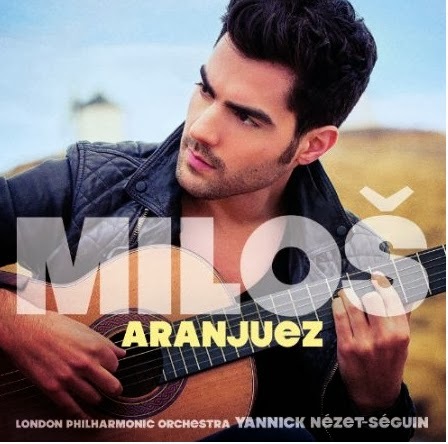 In the DG puff Miloš Karadaglić describes how the Concierto de Aranjuez paints "the landscape of nature, happiness and love". But it is not widely known that the concerto was written in Paris in the spring of 1939 when Europe was hurtling towards the abyss, and Rodrigo was happy to fraternise with both the Nazi and Franco regimes despite having a Jewish wife. The overlooked political background to the Concierto de Aranjuez is explained in Sketches of Spain. Also on Facebook and Twitter. No review samples used in this post. Any copyrighted material on these pages is included as "fair use", for the purpose of study, review or critical analysis only, and will be removed at the request of copyright owner(s).